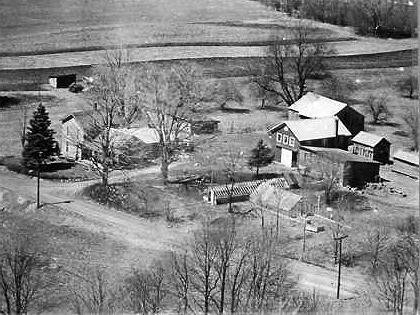 I look at a picture of the old homestead, home for my first 17 years, and my from-place forever. I see a tree, and out tumble thoughts of trees climbed, Christmas trees fetched from the woods, a tangled blow-down in the Adirondacks that I crawled through. I see a barn and recall chilling fires of barns burning (none ours) in the country on otherwise dark, dark nights with brilliant stars. A roof evokes real roofs I've been on, in circumstances legitimate and questionable, and roofs that as a kid I fantasized sprawling on while doing my math homework (but never did). Here are travelogues from a few meanders. More may yet become documented and, given enough rocking-chair time, I may pry open doors to surprising "new" territories of the labyrinth.